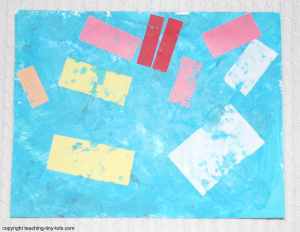 Toddler Activities: Paint with tempera and adhere shapes in a collage Great activity for young toddlers and helps to reinforce color, shapes and learning how to use a paint brush. Have child paint the paper first. Place a small dab of paint to back of cut shape and press onto paper.. There are special containers that can be purchased for tempera paints that help prevent spills, offers an edge to wipe excess paint and covers for future use but an inexpensive container that works well are muffin tins. For children just learning their shapes, focus on one shape at a time. Cut the background sheet into the selected collage shape. 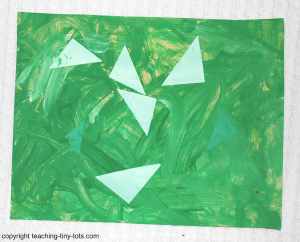 In other words, place triangle shapes on a painted triangle shape. Make into a card or use as wrapping paper. Frame as a gift to a loved one. Small frames in sets of 3 make a nice collage of photos. For a child who is familiar with shapes, cut shapes in various colors and have them identify each as they use them, use shape and color words to reinforce recognition.